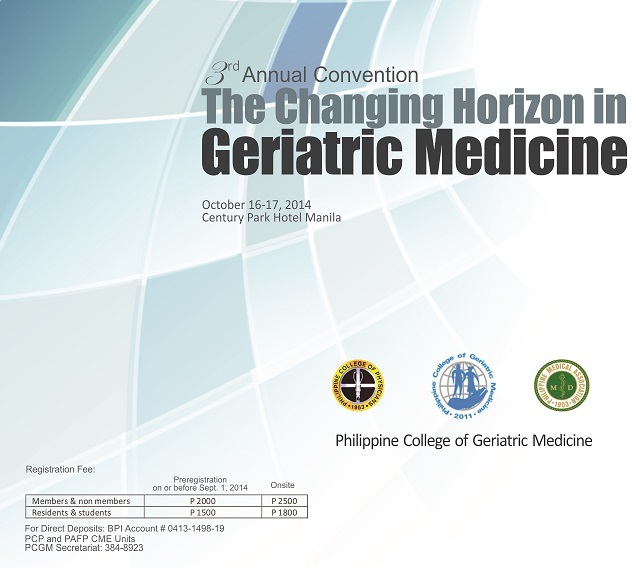 The Third Annual Convention of the Philippine College of Geriatric Medicine focuses on the theme “The Changing Horizons in Geriatric Medicine.” The major objective of the conference is to look into the various issues of the elderly in the different horizons with a view to identify gaps and suggest measures to address them. Understanding the changing horizons of older persons is needed to effectively solve the emerging problems of the elderly. This annual convention will address educational needs of geriatric professionals from all disciplines. This is an annual opportunity for professionals in geriatric medicine (physicians, nurses, social workers, pharmacists, health care administrators, academicians, long term care and managed care providers) across disciplines to network and share experiences with colleagues. There will also be opportunities for research presentation ad poster sessions. Residents in training as well as students can also benefit from the topics at hand since geriatric medicine is already part of the curriculum. The ultimate success would be counted not only by the smoothness of the on-site conference but also the increasing awareness of population towards the challenges of ageing issues to improve the highest possible quality of life for all in the ageing world. So, let us all heed this call by attending this convention on October 16-17, 2014 at the Century Park Hotel, Manila. For reservations and other inquiries, kindly contact Ms. Glenda Ventura at the PCGM secretariat 384-3923 or email at [email protected] PCGM Contact Us Page.